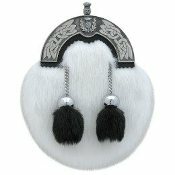 Our Child's Dress Sporran features white faux fur with two black fur feet on the front, and a black grained leather back. Also includes one youth black leather chain strap. Item number MSC-1200.